You can download the animation demo for yourself and try it out locally – all you need is a browser that supports HTML5 video. I know – the music is not quite the same as in the movies, but at least this one is not copyright infringing and it came from the heart (5 minutes in a meeting room in the Mozilla office). So how was this done and what are problems that needed solving? Here’s how and what. That was the easy part. Archive.org has a lot of awesome public domain movies available for you and they are already in the formats needed to use in an HTML5 video element. 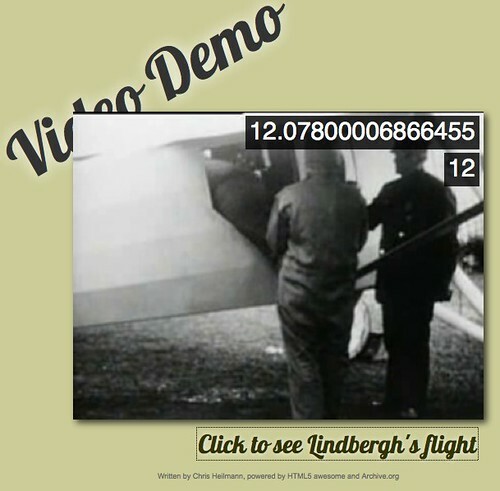 In this case, I took the short movie of Charles Lindbergh taking off for his record breaking flight from New York to fly to Paris in 1927. As the video is markup we can do whatever we please with it – the power of open technologies. For example as we will do here we can set its opacity in CSS and put in on top of a map. In essence, what I did was take the latitude and longitude of the start and end points and calculate as many points in between the two as I need for the duration of the animation. I store the points in an array called pos and then paint a path from the start to the current point and move the map centre to this point on every iteration. Check the highly commented source of the map example for the details. Now, we could use this kind of animation and play the video over it – the problem though is that they may get out of sync. When the movie stalls (as it frequently does on this hotel wireless connection) we don’t want the animation to keep moving, right? Instead of having two sources of timing information we have to limit ourselves to one source of truth. This is the time stamp of the currently playing movie. That way the movie can lag in between and the sequence still stays in sync. Check the source of this demo on Github. 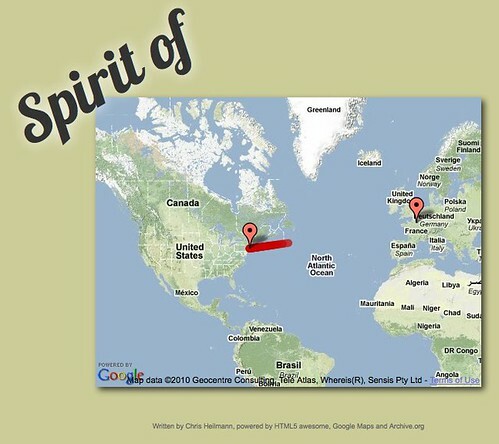 And there you have it – Indiana Jones style maps using open services and open technologies. A workaround for the copyrighted audio (recorded, edited and converted with the free Audacity sound editor) and using Google’s Web Fonts as graphics. Why not have a go – it is free and fun to play. It’s not as cutting edge but it was inspired by the Indiana Jones movies. Actually MP4 has nothing to do with WebKit – Google Chrome (WebKit based) can perfectly play Theora videos. It’s Safari who is the culprit (the mobile one is the real problem, since there is no way to enable Theora/WebM with Quicktime codec plugins like for desktop Safari). Yeah, as I said in the summary :) I will have a go when I get back home – busy meeting week here. That’s a nice project, but did google maps get the route that Lindbergh took wrong? Was it a straight line on a flat map instead of a curve? The Earth is round. This is great, could you not have used SMIL and made it even simpler though? All that setTimeout stuff would disappear and you can still sync the video and animation using event based timing on the SMIL animation. Haha how funny is that!